A week ago Saturday, we decided to go out for breakfast at Paradise Bakery. Because of nut and egg allergies, we brought his breakfast along, but when he asked to play with my fruit cup (practicing his fork skills) I agreed. He picked up a piece of pineapple, dropped it, and gave a very big scowl. I looked to see what was wrong and discovered a long, thin cut in his finger. I thought maybe one of the finger pricks from the previous weeks’ hospital stay hadn’t healed and was infected. So, when we got home, I put some neosporin on it, and a bandaid. That night, when I changed the bandaid, Brian pointed out that the rest of that fingertip and the one next to it looked like they were burned. We asked Patrick how he got hurt. He said the “waterlemon” poked him. We kept doing bandaids and neosporin. And then a couple of days later, I bumped Patrick’s other hand and got the same reaction. He jumped, pulled back, scowled, then started to cry. I looked and, lo and behold, the other hand was dry and cracking too. All of his fingers looked calloused, dry, flaking and cracking. I panicked a little bit. TPN dependence means risks of nutritional deficiencies. Zinc deficiency causes horrible flaking skin ulcers. Fatty acid deficiency can cause dry skin, but only once it’s severe enough that you also start wondering about brain development. I called his dietitian and made her check his labs. They were ok, except a note about low Omega-6 fatty acids. The doctor had just said he thought it was ok. She suggested I rub Patrick in safflower oil. This created quite a quandary for me. Last time I tried safflower oil in Patrick’s diet he had an allergic reaction because all culinary oils are processed on the same equipment so safflower oil can have peanut oil and almond oil in it. So I decided to start using his regular eczema cream and keep asking. I got a good picture of the problem and sent it to, well, everyone. His nurse suggested an allergy to the bandaids or neosporin. His GI and I had a long talk where we discussed ways to get him more fatty acids from increasing the lipids in his TPN to feeding him microlipids through the g-tube, to rubbing him in it. (Which I put more effort into. We stopped at Sprouts market that night and read every label until I found a lotion that had safflower oil, but nothing else he might be allergic to.) Finally, the University of Nebraska called back and said that Patrick’s labs had looked good in February and could not have possibly tanked that quickly and to stop worrying about deficiency. 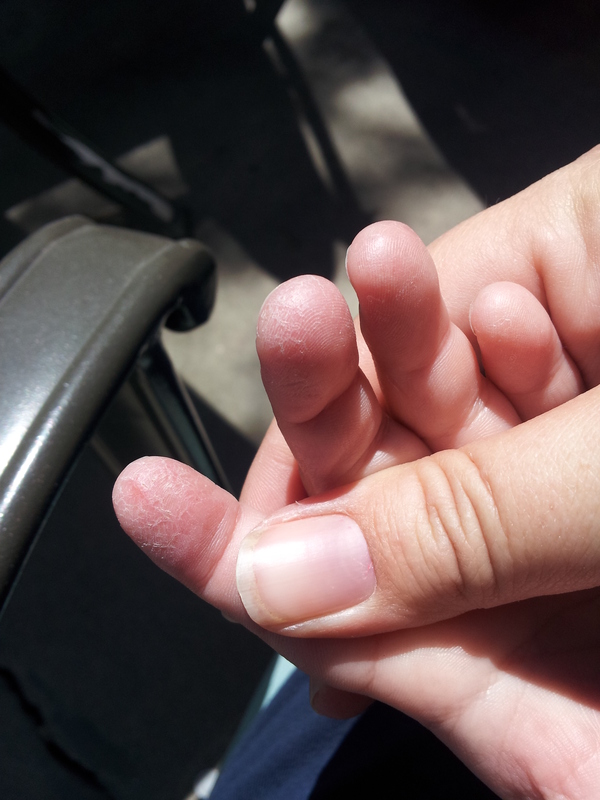 Fingertip eczema. Caused by… a systemic allergic reaction due to prolonged exposure to an allergen. I ditched the bandaids. Switched to hydrocortisone cream and aquaphor… kept rubbing Patrick in the safflower lotion for good measure because of the other deficiency anyway. And I stopped cheating Patrick on his benadryl pretreatment. Because Patrick is allergic to vancomycin, the antibiotic they started him on 3 weeks ago, he is supposed to get a very high dose of benadryl before every dose of antibiotic. But that high dose does a number on his gut, not to mention his concentration and his mood. So when we came home from the hospital, I started backing off the dose. So we upped the dose.. and then we got hospitalized and they took him back up to the full prescription strength. And they made him stay on vanco a few extra days in case that was the cause of the fevers, and then finally let it be discontinued. Patrick’s fingers almost immediately started to get better. They are still dry and we are still doing a good lotion regimen a few times a day. Patrick voted down a few brands, but is really in love with Aquaphor (“Apa-poh”) and several times a day will ask permission to just dip his fingers in it. This is helping a lot. This entry was posted in Adventures, Allergies, Diet, Infections, Life as an SBS mom, Medical updates, Short Gut Syndrome, TPN and tagged allergies, antibiotics, Dr. Jackson, eczema, essential fatty acids, google, learning to eat, nutritional deficiencies, Patrick's words, safflower oil, scary moments, TPN, trials and triumphs, University of Nebraska Medical Center on August 9, 2013 by geekino.